Then... A storm came and Yosemite Valley had a minor flood and some roads closed for a day but this weather effect put some doubt in the minds of the PNW crew if they should risk the long drive, time and money on coming to Yosemite if the weather was going to be crazy. But by the time I could explain that flooding happens quite often and always clears up in a day, the plans were taking motion on their end to change it all up and do the South West instead: Utah, Arizona, Nevada. I still am not sure if he was joking around when he asked "hey wanna come to Utah? ", asking just for politeness sake, thinking there was no way I would just hop in my car and drive 3 states to shoot photos with people I had never met before... Little did he know that the offer was just what I needed and I promptly said "I'll see you there!". After all, I had never been to Utah before or Arizona, 36 countries around the world and I have only been to about 6 US states… There is a lot of catching up to do on my end. Also, what nobody knew was that I was feeling extremely stagnate in my photography. Taking photos of Yosemite is fun, taking photos of people is more fun and at the moment I was finding that there was nothing too intriguing about shooting in Yosemite and I had temporarily run out of people to photograph that I had never photographed before. Next thing, I was packing my bags, charging my camera batteries and looking at weather reports. I had to be out of the door in less than 24hrs if I were to meet up with them in Utah.... Now what any good traveler knows, when you are traveling with friends or family, a sh*t show of logistical planning can go right out the door from one second to the next. I knew that all too well after traveling with friends in groups all over the world for the past 15 years... So my timing catching them had to be almost NASA certified if we were to lock lenses somewhere in the middle of the desert. The other problem was budget, I had very little so I knew I had to make this entire trip work for less than $200 including gas, food and or lodging. Plus an array of micro usb cables, extra batteries, remote triggers, cinema rigs and filters, etc. 9 Starbucks americano’s and 22 stops later, we finally rolled into a little place called Springdale, Utah at about 10pm.. Since it was dark we did not get a good lay of the place, all we knew from trading text messages with Brayden was the name of the hotel to meet but we had no accommodations reserved and paying $140+ for less than a 10hr stay was not appealing or in the budget. The best option was to sleep in the car, and the only problem beyond limited leg space was having to wake up every few hours to start the engine in order to avoid the windows freezing from the condensation inside the car.. this did not leave the best night sleep available to us. Waking up the next morning with 11 hours of driving and 2hrs of sleep behind me, I was really surprised how amazing this little town is given the fact it is in the middle of nowhere. I did some quick searching on Google Maps for a coffee spot that might be open at 6am and not holding out for much hope, I was really surprised to see something pop up. A few minutes drive up the road towards the park entrance we found Cafe Soleil which was a serious oasis for mind and body because they not only had amazing coffee but even more amazing breakfast. The Southwest Stacked Scramble ... that's all you need to know.. absolutely hands down one of the best breakfasts I have had in over a decade.. And remember that’s coming from someone who is seriously picky about breakfast. After breakfast and coffee was down, we met up with the rest of the crew at the hotel. Based on the previous night's texts, I knew they did not get into Springdale until around 1am so everyone was feeling pretty haggard... Some quick introductions later and we were out the door on our way to Zion National Park. Needless to say, I was completely blown away… Not only is Zion something like a weird Yosemite in a red hue but the geography is visually stunning and leads you to question whether or not you accidentally stepped into some sci-fi mars movie... And since it was about 32 degrees out at 10am, everything was still frozen for the most part. Which again, created it’s own unique winter charm. I like seeing little frozen waterfalls and streams. 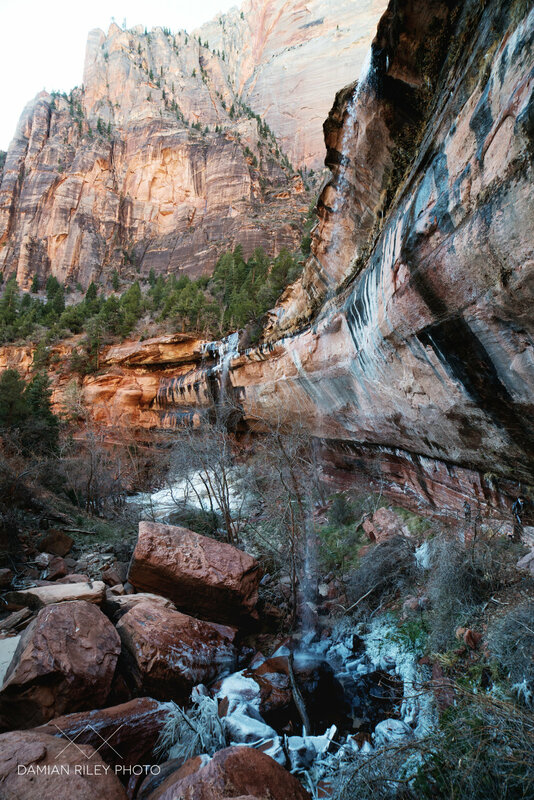 The frozen pathway to Emerald Pools in Zion.. Beware, it's a really icy trail in the winter when you go under the waterfall, watch your step! 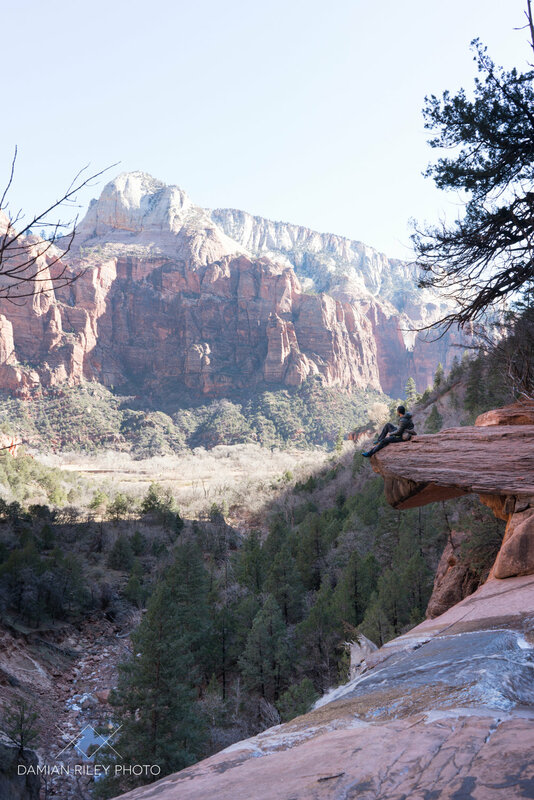 The next 8 hours consisted of a mini-massive tour of lower Zion and though deep inside I felt a little weird about shooting photos so close to the entrance to the park, I could not pull myself away from shooting everything I could see... I kept thinking to myself “I am now one of those people shooting photos at Arch Rock entrance of Yosemite” … Not realizing that so much more is ahead... But oh well, that's all part of the experience. Braybraywoowoo setting up the shot. 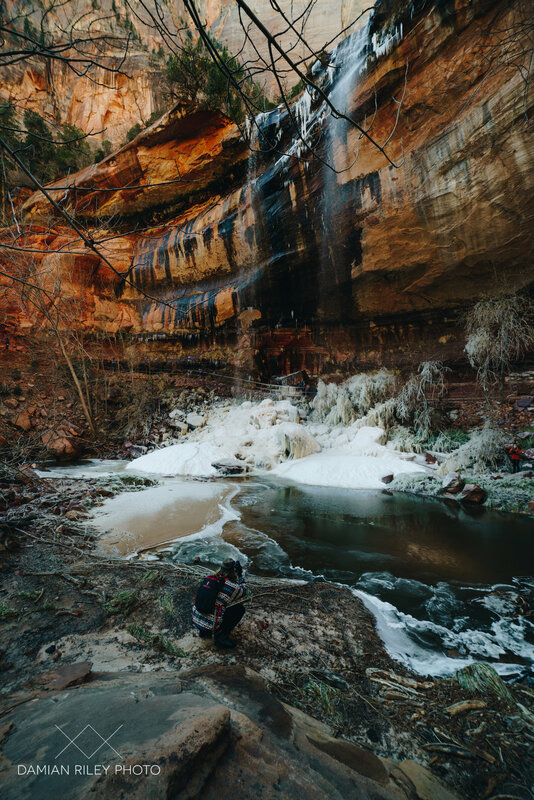 Our first stop was Emerald Pools, we ran around the trails and to the uppermost waterfall which was half frozen but provided spectacular views and the sounds of crashing ice blocks falling every few minute... Afterward we made our way back down the trail, past the frozen pathway of doom and back to the car where we consumed a quick lunch and headed for the Canyon Overlook. The canyon overlook trail was reminiscent of Taft Point in Yosemite; a very popular spot to visit but with only about 10 parking spots available unless you want to pull off the side of the road and hope that your car does not get side swiped by a passing driver. Making the way up the trail the walking pace was quickened by the rapidly descending sun behind the canyon walls. Most all of us were photographers and missing a sunset in such an epic place would be just sacrilegious. Thankfully my cardio is still somewhat on point and after jogging the last few sections of the trail we arrived at the canyon overlook. The overlook point itself is not that impressive, it views south to north so the sunset or sunrise is slightly behind either side of the canyon to your left or right… “until” you get higher. I spotted a small beaten down path that led up the side of the mountain. Nobody was up there so that told me it’s probably the best place to be. If I am going to get a cliche photo from an iconic spot on the globe, I at least want to shoot from a slightly different angle then what would be the norm. We made our way up the side of the mountain and the sunlight that had creeped behind the canyon walls came back out into focus. The remaining evening photos were captured from this higher vantage point and I really could have just stayed up there until the stars came out, and in hindsight I really wished I had .. The Utah night sky is stunning beyond belief. After making our way down trail and back to the cars, we agreed that we would split ways for the night. 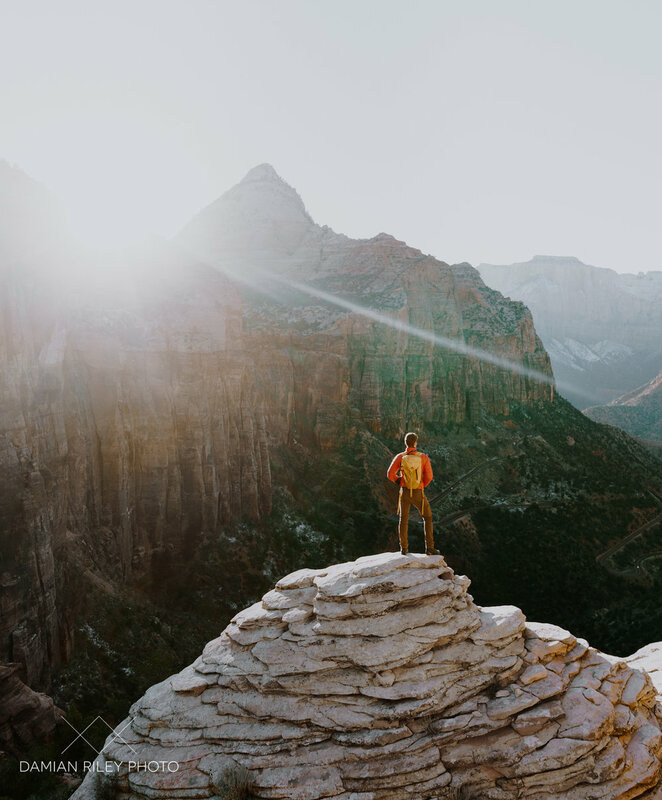 Hours earlier I received a message from my buddy Karl Shakur who I had not seen in nearly a year and just happened to be rolling into Utah at around 11pm that night (also to shoot photos). Feeling seriously sleep deprived with about 10 miles of walking under my feet, all I could think about was catching some zzz’s and meeting up with the rest of the crew the next day but I really could not pass up the chance to see Karl and get some shots in with him. A few hours later we finally met up with Karl around 11pm, jumping out of cars and getting straight to business of shooting photos of the night sky… It was nearly just like the last time I had seen Karl when we were on a 3 day hiking trip in Yosemite… Only this time he moved up quite a bit in the social media world, going from 4 to nearly 25,000 followers in less than a year. 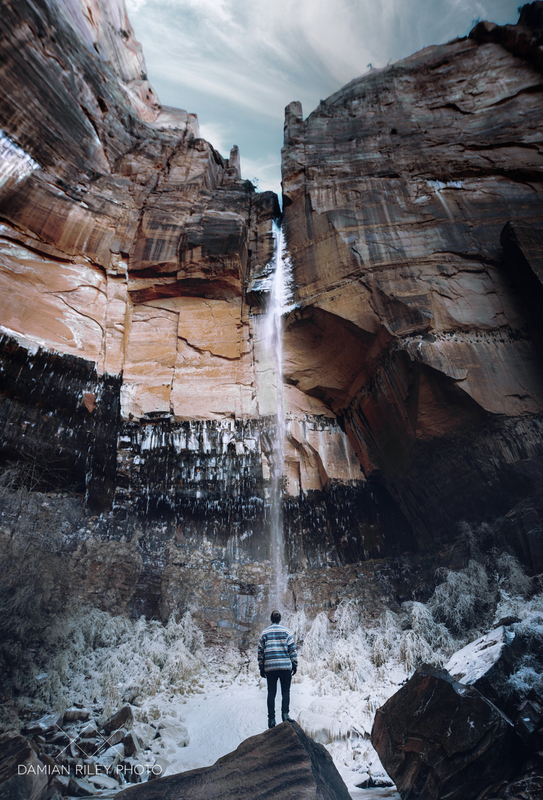 If you’re on Instagram you should check out his work karl_shakur. His work is stunning, his ethic is solid and his fundamental belief in photography is something to aspire to. 2am we arrived in Page, AZ at a hotel. 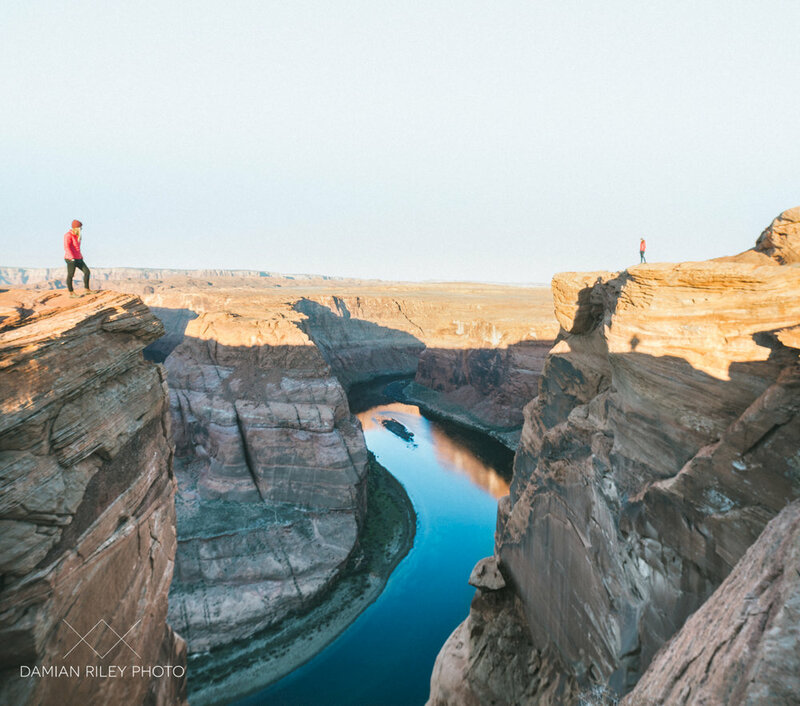 Woke up at 6am to go shoot Horseshoe Bend with the PNW crew. Split ways from PNW crew. Got in argument over people trying to stop me from jumping a 3ft gap with a 400ft void beneath it for a shot. To wrap it up.. It was an amazing adventure, made even more amazing by the people I got to experience it with.